We've just been taking a look at artist & cultural activitst Martin Firrell's website, and it's rather lovely. He works principally with projected text, and has created site specific pieces for the National Gallery, the Tate Britain and the Royal Opera House. He also created the Complete Hero project, which has been screened at Curzon cinemas. His next project The Question Mark Inside will be a series of projections onto St Paul's Cathedral in November 2008, to celebrate the 300th anniversary of the topping out of Christopher Wren's masterpiece. The projections will go onto the Cathedral Dome, the Ludgate Hill elevation and inside on the wall of the Whispering Gallery. If you fancy getting involved, you can participate by adding your own thoughts on the meaning of life, and the meaning of St Paul's, at the project blog. Just a quick post to let you know that the first Ephemera Society Fair of 2008 takes place this Sunday in Bloomsbury. If you've not been before it's well worth stopping by - you'll find a huge selection of printed ephemera, including advertising posters, travel documents, personal letters, old photographs, books, invoices and all manner of other printed goodness. We can't make it, but if you pick up anything tasty, do drop us a line. The fair takes place on Sunday 3 February between 11am and 5pm at the Holiday Inn, Coram Street, London WC1N. It's just £3 to get in. We made our way over to the Tate Modern on Saturday to check out the new retrospective of work by Spanish artist Juan Muñoz. Muñoz's last big exhibition at the Tate was his installation Double Bind in the turbine hall, shortly before his tragically early death in 2001. The show is really quite brilliant. His work plays with the human figure, often at a distorted scale, and often in monochrome. It's a quiet show, but one that draws you in, allowing you to hang out in a very different world for an hour or so. Stuttering Piece (1993) in the next room is small enough to almost be missed, but is a fantastic little installation of two doll-like figures engaged in a constantly looping (recorded) conversation. It's enormously reminiscent of Beckett and Pinter at their best, and reflects the theatricality present in much of Muñoz's work. You should also make sure you check out the extra bit of the show, down on level 3, collectively called Conversation Piece. Do try to get along, it's a great show. As a footnote, we were gutted not to be able to take pictures at the show - we were very sternly told off when we tried, even though we were just using a camera-phone. The Tate has a rather draconian photographic policy, which we suspect might be in place to make sure that they sell lots of postcards. It's a real shame - visitors instinctively want to take pictures, and doing so brings them into a much stronger relationship with the work. You're allowed to photograph the work in the Turbine Hall, so it seems a shame not to allow it in the exhibitions. 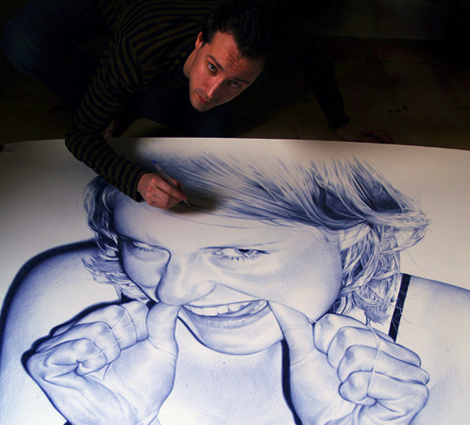 You've probably got a Bic biro. It's probably somewhere in your desk drawer, maybe hidden under some old post-its and a mess of elastic bands. You've probably had it sitting there for years, while you lavish your designer love on the showier stylings of a Gel Ink Rollerball Softgrip™ 0.5 tip Tecpoint Fineliner (only £6.50 each). Well shame on you sir or madam! Shame on you. For just look at what your humble Bic can do if you truly have the skill to make it sing. This is the work of young Andalusian-born artist Juan Francisco Casas, who's currently got a show on at the Galeria Fernando Pradilla in Madrid. 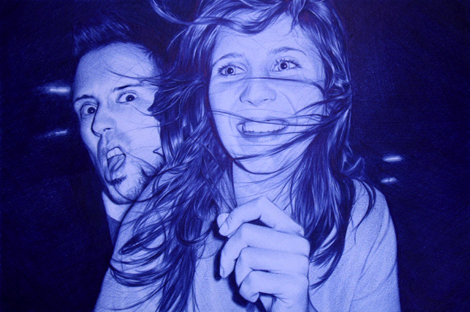 He creates photorealist ballpen drawings and oil canvases, reproducing in incredible detail snaps of fleeting moments that he takes on his camera. Check out more on him at his MySpace page. And if you fancy seeing what else people are doing with their Bics, check out this article about Reinventing the Bic Pen from Designboom. We made our way over to the recently revamped London Transport Museum this weekend, and wow, what a treasure trove of graphic brilliance it is. You're given a folded card-guide of the museum as you go in, and as you wander round the museum you punch the card at thirteen stops that mark out different areas of the exhibition. It's a really smart way of encouraging kids to explore the whole place. You kick off your journey by taking the lift to the second floor. As you ascend, the usual floor indicator LED sign instead shows the years ticking past in reverse, so that you travel from 2007 back to 1800. There's an accompanying set of audio-clips that help to make you really feel that you're heading back in time. It's a charming and simple way of getting your imagination in gear. 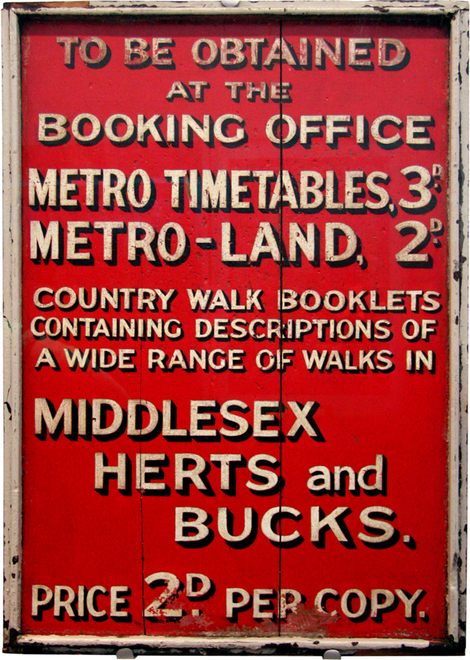 The exhibits are the expected examples of tube carriages, hackney cabs, models of stations, and even some waxwork figures; but what really stands out is the wonderful collection of graphic ephemera. The walls are covered in fantastic posters from across the years, and there are several plan-chests full of bits and pieces of ephemeral wonders. Check out Alistair's Flickr set for more pictures. There's a great shop (naturally), with a particularly fine poster collection (which you can browse online too). 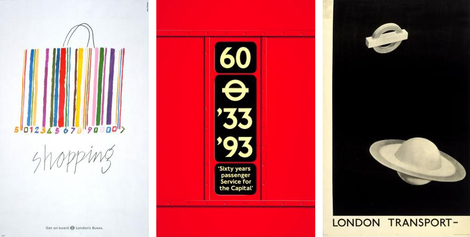 The ones above are by (from left to right) Alan Fletcher, David Pocknell, and Man Ray. 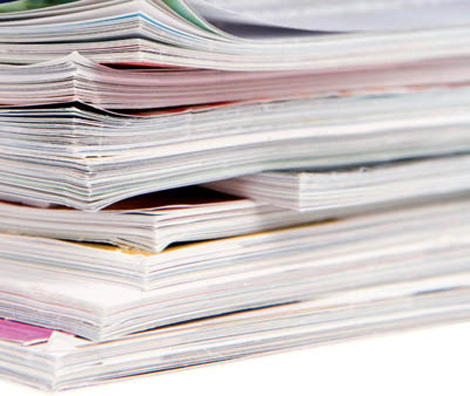 Magazines are dead! Long live the Magazine! Ay caramba! Apologies for the slightly late notice on this, but there's a staggeringly good one day conference happening over at the St Bride Library next Friday (25 January). Magazines are Dead! Long live the Magazine! will explore the past, present and future of magazine design. There's an incredible line up of speakers, including Tony Chambers, editor-in-chief at Wallpaper*; Luke Hayman, design director of New York magazine; Jeremy Leslie, author of magCulture and design director at John Brown; Richard Spencer Powell, creative director at the beautiful Monocle magazine; and Simon Esterson, art director at Eye magazine. The full programme is available here. Tickets are £60, or £35 for concessions. So, the Cupertino kids have been getting busy again, with Apple launching a raft of shiny new tech goodness on Tuesday afternoon. You can watch Steve Jobs wowing the fanboys on this film of his keynote speech. They've launched a super slim laptop, a new and improved version of Apple's set top box for renting movies directly to your TV, added Mail and Maps to the iPod Touch, added movie rentals on iTunes, and also launched Time Capsule, a new external hard drive which plays nicely with the latest version of OS X. 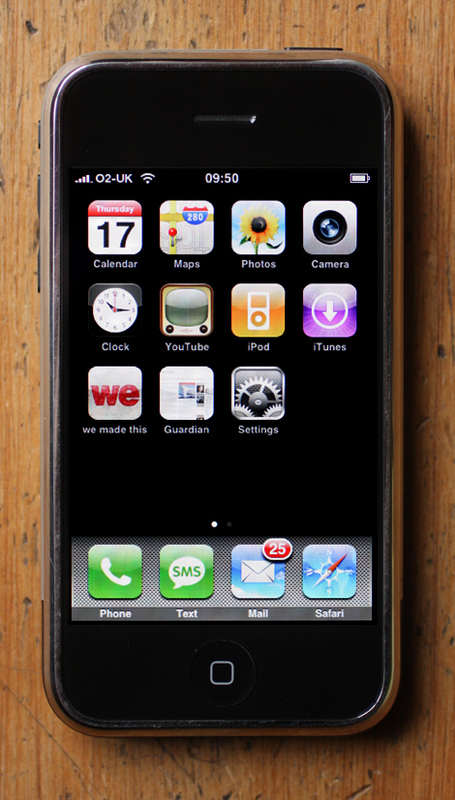 We were most happy to see the updated iPhone firmware (v.1.1.3), which means that you can now customise the home screen on your iPhone. About time really. You can now ditch the applications you don't use (or at least slide them across to a second home screen), and create icons for your favourite web pages. Usually when you do this, you just get a screengrab of whichever webpage you're bookmarking (like The Guardian one in the picture above), but brilliantly, Typepad, who host our blog, have also made it possible for bloggers to create customised icons for their blog, so that you get a proper smart'n'shiny icon. So, if you're an iPhone user and a We Made This reader, you can go ahead and stick us on your homescreen without worrying about it looking all messy. Hoorah for tech goodness! Hmm. No Valentine's plans just yet? Join the club. Jonathan Barnbrook - graphic designer; Kenichi Iwasa - filmmaker; Julia Lohmann - designer; Maria Marshall - artist; Claire Merry - Japanesey; Emi Miyashita - artist; Emiko Oki - designer/ceramicist; Sachiko Paris - vision Hairdressers; Christopher Purvis - Japan Society; Fenna Haakma Wagenaar - architect. You may have to already be on the Pecha Kucha mailing list, we're not totally certain. If you want to try your luck: email pechakucha@jpembassy.org.uk with "Pecha Kucha Valentine's Night - PK" in the subject, giving your name, email address, telephone number and affiliation within the body of the message. In the north-west corner of Trafalgar Square there is a plinth. From 1841 until 1999 it stood empty, but more recently it's become a location for high-profile contemporary art, commissioned from leading artists, with each work being housed on the plinth for a year or two. This is mainly thanks to the RSA who initiated a programme of new commissions for the plinth in 1998. The first piece that went up was by recent Turner prize winner Mark Wallinger. He created Ecce Homo, the rather elegant life size Christ figure, in 1999. Then Bill Woodrow had a go with Regardless of History, the book and tree sculpture, in 2000. 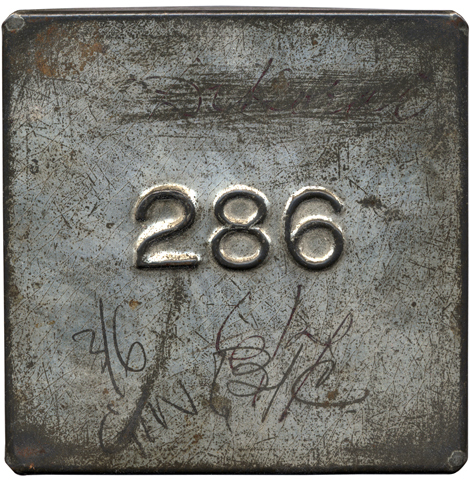 Rachel Whiteread created Untitled Monument in 2001, an inverted resin cast of the plinth, which if you looked at it upside down, looked a bit like the entire planet had been put on a plinth. In June 2002, a David Beckham waxwork model had an unauthorised appearance, but the GLA didn't let that last too long. Marc Quinn's fantastic sculpture Alison Lapper Pregnant was next, from September 2005 to last October, neatly referencing the nearby one-armed Nelson. 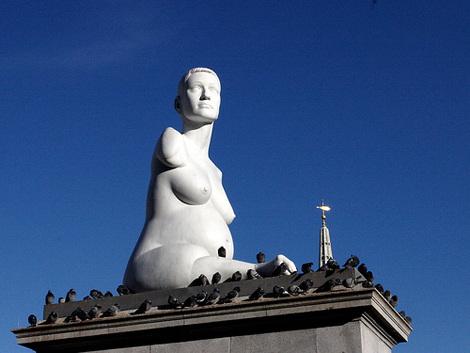 It was the first commission from the Fourth Plinth Commissioning Programme (after responsiblity for Trafalgar Square was transferred to the Mayor and the Greater London Authority). The second in that series is Thomas Schütte’s sculpture Model for a Hotel, which was unveiled in November. It's made of a specially engineered glass (in yellow, red and blue) which collects light and reflects it through its edges. We think it looks a lot more 1987 than 2007, which is either a good thing or a bad thing, depending on whether you experienced the 80s or not. The six proposals for the next piece to go up have just been unveiled, and are on show at the National Gallery from now until 30 March. The lucky winner will be announced by the Mayor later in the year. 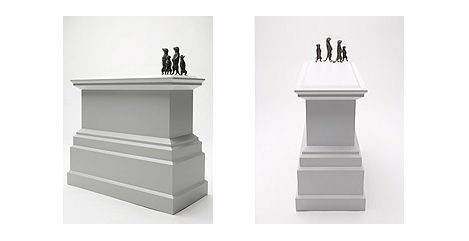 We really like the Fourth Plinth project, so we've decided to show all the proposals here, together with the explanations for each piece. "‘The presentation of the spoils of war to a curious public dates back at least to the Roman Empire. My idea for the fourth plinth performs a similar role’, says Jeremy Deller, ‘It is not an artwork, but the remains of a vehicle that has been destroyed in an attack on civilians in Iraq’." "For some years Tracey Emin has been interested in the social behaviour of meerkats, small mammals that live together in an egalitarian order in the Kalahari Desert, southern Africa. She has noticed that ‘whenever Britain is in crisis or, as a nation, is experiencing sadness and loss (for example, after Princess Diana’s funeral), the next programme on television is Meerkats United’. 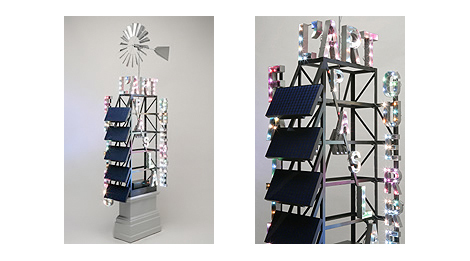 Emin proposes to place a sculpture of a small group of meerkats on the empty plinth as a symbol of unity and safety." "Antony Gormley proposes that the fourth plinth is occupied 24 hours a day by members of the public who have volunteered to stand on it for an hour at a time. Over a period of 12 months, 8,760 people would take part. 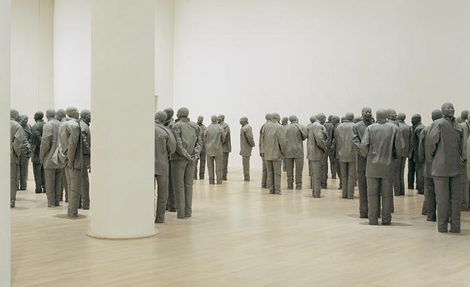 ‘Through elevation onto the plinth and removal from common ground’, explains Gormley, ‘the subjective living body becomes both representation and representative, encouraging consideration of diversity, vulnerability and the individual in contemporary society’. This is particularly pertinent in the context of Trafalgar Square with its military statues honouring specific individuals." "Sky Plinth literally brings the clouds down to the ground ‘displaying’ the changing sky-scape as a ‘monument’ on Trafalgar Square. The five concave mirrors cantilever off the plinth treating all its faces as supports. 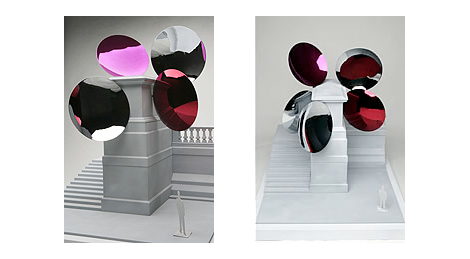 The plinth is thought of as an object which is dematerialised by the mirrors. 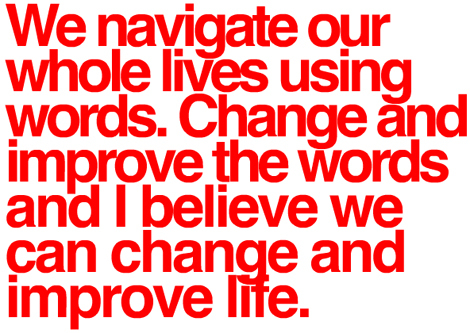 They turn the world upside down and in so doing bring the sky down to the ground." 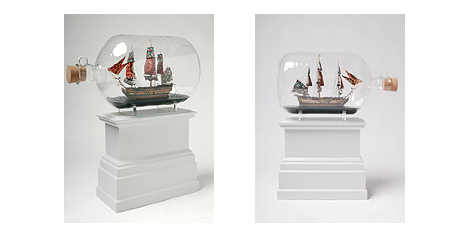 "Turner nominated Yinka Shonibare proposes to make a scale replica of Nelson’s ship, HMS Victory, in a giant glass bottle. The ship’s magnificent sails will be produced in richly coloured and patterned textiles, which Shonibare buys from Brixton market in London. They are assumed to be African but in fact the fabric was inspired by Indonesian batik design, mass produced by the Dutch and sold to the colonies in West Africa. By the 1960s the material was popularly assimilated in Africa and became symbolic of African identity and independence. Shonibare says his piece will reflect the story of multiculturalism in London today, which began as a result of Nelson’s victory at the Battle of Trafalgar: ‘For me it’s a celebration of London’s immense ethnic wealth, giving expression to and honouring the many cultures and ethnicities that are still breathing precious wind into the sails of the UK.’"
"This illuminated peace sign – powered by the sun and the wind – questions our ideas about history and monuments on the one hand, and art and war on the other. The work, which is a collaboration between renewable energy specialists, structuralengineers and an architect, seeks to rebrand Trafalgar Square as a beacon of our cultural future rather than a memorial to England’s military past. Bob & Roberta Smith believe in ‘the power of art to act as a social force as great and necessary to our lives as the police, the military and the judiciary’; their proposal is meant as a ‘gentle provocation to the overwhelming “Hogarthian” stature of Trafalgar Square as the centre of celebration of Britain’s military achievements over the French’." We like Deller's piece, though we can't see the GLA going for it; Emin's is funny (which is no bad thing - art doesn't have to be serious, though it should make you think); Gormley's has the whiff of homework done on the bus on the way to school; Kapoor's is interesting, but not as elegantly simple as his best work; Shonibare's is great, but the pigeons would make a right old mess of it; and Bob and Roberta Smith's is a nice idea, but a bit cluttered for our tastes. If you fancy telling the commission what you think, there's an online public consultation form here. 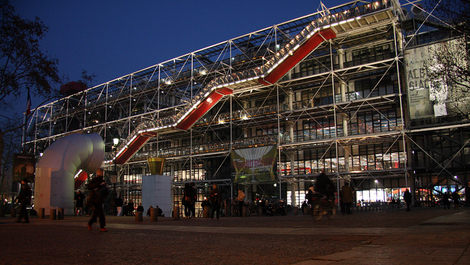 While we were out in Paris just before Christmas, we managed to make some time to see the retrospective of architect Richard Rogers (and his practice) that's currently on show at the Centre Pompidou. And damn, we're glad we did. It's a fantastic show. Thanks to the three glass facades of the Galerie Sud, the exhibition is open to the city and visible from the street, respecting in this the basic principle of the builiding that Rogers designed with Renzo Piano. On the fourth side the only solid wall offers a comprehensive chronological presentation of 40 years of professional activity, taking in hundreds of projects and completed buildings. The 50 or so projects selected for the exhibition itself are presented on tables, abundant natural light being supplemented by that from the fittings designed by Rogers' practice. In the middle of the exhibition there's a large (and very pink) soft seating area, where you can lounge about and read a selection of books about Rogers' work. We left with a much better understanding of his buildings, and a real sense of respect for the practice as a whole. If you get the chance, do make the trip. You won't be disappointed.